CHASING FOOD DREAMS: Gourmet Hotdog Café, PV128 @ Setapak: Hotdogs Made with Love! 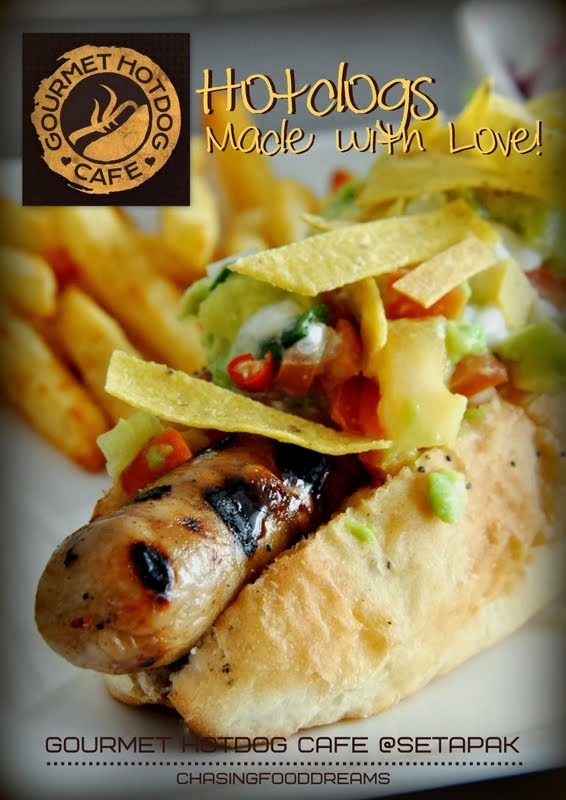 Gourmet Hotdog Café, PV128 @ Setapak: Hotdogs Made with Love! Eat Gourmet Hotdogs and Win a Trip to Maldive! A bit of overdue for this post since I was away for my trip, I am still happy to say that gourmet hotdogs have finally landed a spot in our city ever since the gourmet burgers craze took off last year. And it’s about time too! I have always felt that the spotlights were never on hotdogs enough. These long weenies, as they are often called in other countries, if made well with quality ingredients are just as awesome as any burger I know. In fact, it might even be better in flavors since hotdogs or its fancier sausages are always well seasoned with various seasoning before being snuggly encased in its casing. Before I deter further and further from my initial point, I was actually looking forward to Gourmet Hotdog Café (GHC) when I first saw it on their Facebook. In fact, I admitted to following them while they were testing their house made hotdogs and was literally salivating through the world wide web whenever GHC’s team posted their updates. Gourmet Hotdog Café came to life when brothers Muju and Muku Naeem just couldn’t satisfy their cravings for a darn good hotdog in Malaysia. After taking the leap into the F&B business, both set sail on a long journey of hotdogs testing before Gourmet Hotdog Café was finally born in late 2013. 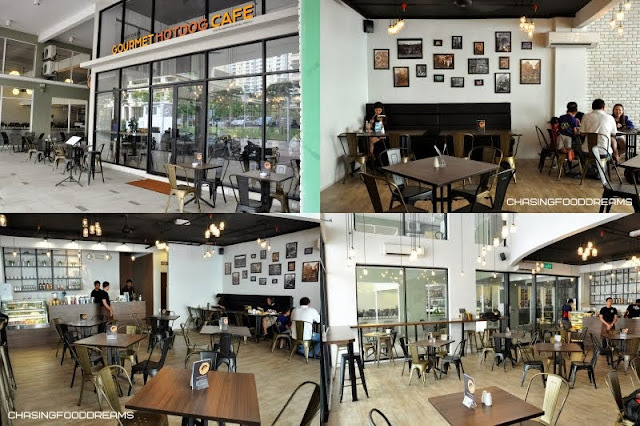 Located in a long mall on PV128, Jalan Genting Klang, the café is situated on the back of the mall. The café is designed with minimalist and cozy chic interior. Housed in glass walls with artistic hanging lights made with glass bottles, there are tables, booths and bar to choose from for seats. A collection of framed artworks dressed one wall. Furniture are a combination of steel and wood. A small bar counter with a chiller is located at the back of the café. 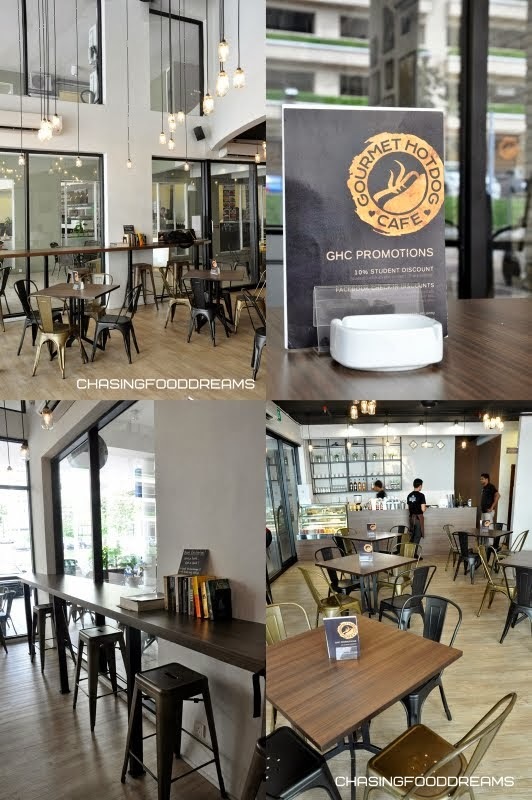 GHC offers free Wifi and is perfect for those who needs a hangout place for some food and work. As we were cordially invited by Muju, we got a chance to get more insights to what makes GHC so unique. All hotdogs served in GHC are made locally to GHC’s own recipes. Chicken hotdogs are made with 100% skinless lean chicken breast only while lamb and beef are made using New Zealand and Australian meat. All hotdogs are guaranteed with 90% meat in certified halal natural casings and uses all natural ingredients and seasonings. 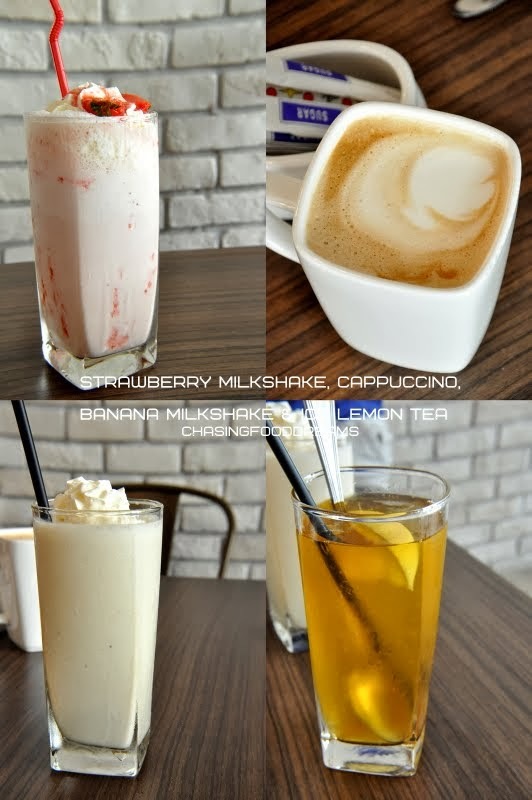 GHC’s drink menu is really decent as they also offers coffees, tea, fresh juices, milkshakes and sodas. We savored a rather delicious creamy Banana Milkshake and a Strawberry Milkshake. I had Iced Lemon Tea while another had Cappuccino. Drink prices are affordable, with nothing over RM10. GHC’s even has some starters on their menu. We opted for Nachos (RM9.90), a platter piled with crispy tortilla chips covered in melted cheese, tomatoes, jalapeno peppers and cheese sauce. It makes a nice munching starter for those who love the crunch factor with cheesy creamy goodness. Our hotdogs arrived and I was pleased. Please indeed with what I saw. Hotdog protruding out of its bun is definitely a great sign! To be honest, there is a long list of gourmet hotdogs in GHC’s menu that it was a tough decision on what to order. I liked almost every variation listed in the menu. In the end, we settled for some recommended by Muju. All hotdogs comes solo or as a meal. The meal comes with GHC coleslaw and fries. The Coney Island, takings its famed from the Coney Dog made famous by a fast food chain (at least to me it was), was a lamb and beef merguez banger sandwiched with a poppy seed bun before being smothered in GHC’s house made chili, chopped raw onions and shredded mozzarella cheese with mayo. All that good stuff works like a dream in my books. The banger is spiced up with a nice balance of seasoning and herbs and there is a great textural bite to it. Juicy and tender, the banger works well with the spiced up chili stew of beef minced and beans. Onions gave this a nice kick while mozzarella cheese does its magic on giving it the creamy cheesy edge. The bun was average but everything was really yummy! Take a closer look at how well made the gourmet banger is! The Sombrero showcased a nicely grilled chicken banger in bun and crowned with a Mexican must-have of creamy guacamole, pico de gallo, sour cream, coriander and fried tortilla chips. Whoever thought of this combination deserves a pat in the back! The grilled chicken banger is juicy but a bit soft. Flavors are delicious, tasty and smoky. The creamy guacamole made from roughly smashed avocado blend well with its tasty Mexican side kick of pico de gallo, which is a tomato salsa. Lightly creamy sour cream and crispy chips makes this Mexican inspired hotdog a force to be reckoned with. I would have loved to add in jalapeno pepper to kick this up another notch! It was thoughtful of GHC to cater to vegetarians and its menu had three choices of The Angelina, Mrs Kraut and The Alexa. We took on The Alexa as it came highly recommended. Featuring the GHC falafel log, a hotdog made with chickpeas and beans without a casing, it came in its usual poppy seed bun with a light salad mix, tomato salsa, guacamole, sour cream and spring onions. I never thought I would say this to a vegetarian hotdog but it rocks! It was a unanimous decision that The Alexa was really tasty and yummy. It may look a little unusual but once you had a taste, you would agree with me that this is one tasty hotdog. The falafel dog is very well seasoned and full of flavors. It has a nice creaminess to it too. I like the condiments too. I would definitely order this again. I love Rueben sandwiches. A classic turn into a hotdog, The Reuben has beef banger, sauerkraut, sweet green pickle relish, caramelized onions, mozzarella cheese and GHC’s take on the Russian dressing. We asked for the chicken banger for this since some of us don’t eat beef. I adored the caramelized onions that go so well with the banger. This one had a lightly tangy flavor from the sauerkraut with creaminess from the GHC sauce. Personally, I really like the lamb and beef bangers because of its flavors and textures. There are also more gourmet hotdogs that I would love to try like The Classic Chicago, The Philly, The Yank(ee) and The Memphis Blues. If you don’t like the gourmet hotdogs in a bun, there is a Beef or Chicken Cumberland grilled and served with sides. All hotdogs are priced from RM10.90 to RM12.50 while a meal may be a little more. I am always pleased when a café or restaurant offers a kids’ menu. GHC Café has one and so we ordered two for mine and another kid. Since kids like their food plain, we ordered the Plain Weenie with Fries or Mashed Potato (RM5.90) and Mini Corn Weenies (RM5.90). The Plain Weenie is actually the regular chicken banger nicely chargrilled and sandwiched with the poppy seed bun. The Mini Corn Weenies are little hotdogs fried with corn batter. Needless to say, both kids walloped their meal happily. Besides gourmet hotdogs, GHC now serves up a side menu of other dishes to please everyone. We tasted their Roasted Chicken and Spaghetti Carbonara with Chicken Sausage. Both are below RM20. The Roasted Chicken is yummy, nicely golden and drenched in brown gravy with sides of coleslaw and mashed potatoes. It’s homey and flavorful, moist and tender and features a generous portion of a spring chicken. The Spaghetti Carbonara is creamy and studded with pieces of chicken sausage, mushrooms and peas. We ended our lunch with desserts! GHC’s desserts are made by the house chef and changes on daily basis. We had a fruity Strawberry Shortcake and a luscious Irish Cream Cake. The food at Gourmet Hotdog Cafe is honest, delicious and great. Prices are really affordable. I wish GHC is nearer to my home so frequent visits are easier. Halal certification is work in progress here. Here’s something else to give everyone extra reasons to visit GHC this month! Win a Trip to Maldives for Two! 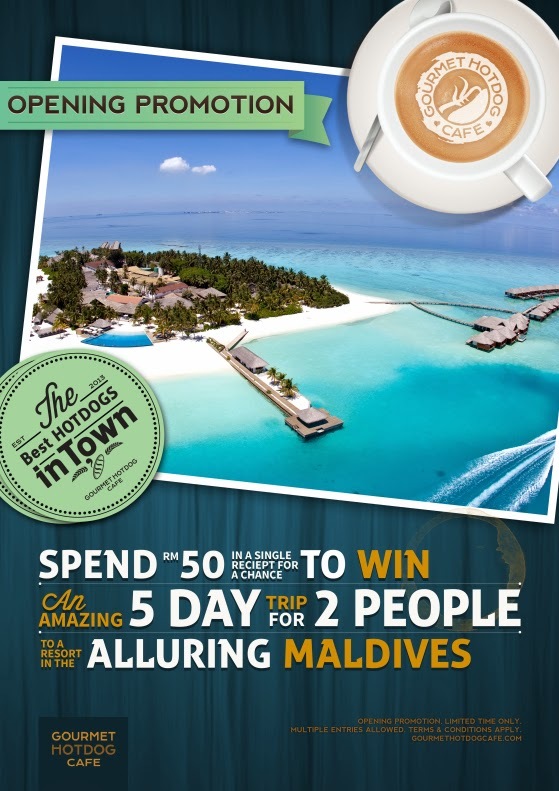 GHC is now running a competition and the prize is An Amazing 5 Day Trip for 2 People to Maldives! Just spend RM50 and you’ll be eligible to participate for the lucky draw. Contest period runs from 26th September 2013 to 31st January 2014. Any eligible purchases made during this time period will be entered into the draw. To qualify for the lucky draw, participants must make a minimum purchase of RM50 on a single receipt of any of GHC’s menu items during the Lucky Draw period. The interior decor looks like one of the cafes here in Penang... i don't always hunt for Hot Dogs as they are rarely filling and with the calories, i'm always upset with that hehe. Hot dogs must remind you of the NY trip! The vegetarian hotdog surprisingly taste really good! I usually only buy frozen packet hotdogs to prepare at home. I am heading there this week!!! Cant wait to take a bite on The Reuben and Alexa!!! Mmmm I don't even like hotdogs but your pictures look so good! I think I will like the mexican one and the vegetarian one the most. Prices seem quite reasonable too.